I had bananas ripening for banana bread. It's one of my favorite things to make. As I was talking to a friend about it, she said I should use the bananas for banana ice cream instead. Banana ice cream is so popular on Pinterest, but it wasn't something I had made before. I have such a sweet tooth, especially for ice cream, and I couldn't imagine how bananas would be a substitute. Banana ice cream is so amazing. I actually made chocolate banana ice cream. It was so healthy and so indulgent. The only thing I didn't like was that I didn't make more of it! If you're on a wedding diet and craving sweets, this is perfect for you. Trust me. Slice the banana and freeze it overnight. Put the banana slices in a blender and blend until the bananas are chopped finely. Add the cocoa powder and honey, then blend a couple minutes until the mix is very creamy. Pour it into a container (I reused the one the bananas were frozen in), add a pinch of salt, and stir. Eat it immediately if you prefer melty ice cream; freeze it overnight if you prefer an icier ice cream. This recipe makes about six cups of chocolate banana ice cream. My mom figured it out to be about 94 calories a cup, which is incredible. You really get a great chocolate taste. There's actually not much of a banana taste. I mean, you know it's there, but I've had chocolate ice pops that were banana based and all I could taste was banana. This wasn't like that. When I was on a wedding diet, I really was conscious of my calorie intake. I would limit myself to fun sized candy bars so I could have the taste of chocolate but still have a double-digit calorie snack. I wish I had found this ice cream because it would have been a staple for me. If chocolate isn't your thing (for shame! ), you can play around with flavors. Swap the cocoa powder for frozen fruit (strawberries would make a tasty strawberry ice cream). Or, if you want to keep the chocolate, add peanuts for a crunch. Those changes will change the calories, of course, but the swaps might be perfect for you. BRIDAL BABBLE: Would this chocolate banana ice cream satisfy your sweet tooth? Getting in shape for your wedding? 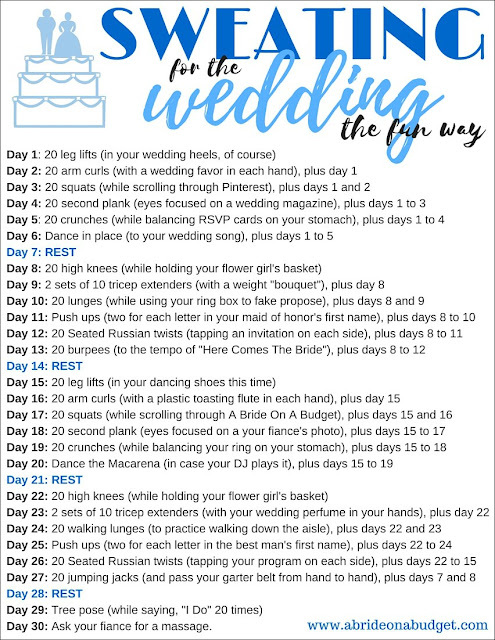 Check out our Sweating For The Wedding 30-Day Challenge. Sweetness without the guilt...LOVE! Thanks for joining this weeks Tasty Tuesday, I can't wait to see what you share next week! Amanda above said it better then I could. Guilty pleasure without ll the guilt! Love this idea 🙂 Totally want to have a hot chocolate bar sometime this season!